CSM’s stimulating March 4 “March Forth” activities, called “A Call to Action: Educating the Whole Student,” focused on advocacy, student support services, and some of the academic areas most heavily threatened by budget cuts. The CSM Theatre and adjoining area were the site of continual action from 8:00 a.m. to 2:00 p.m. 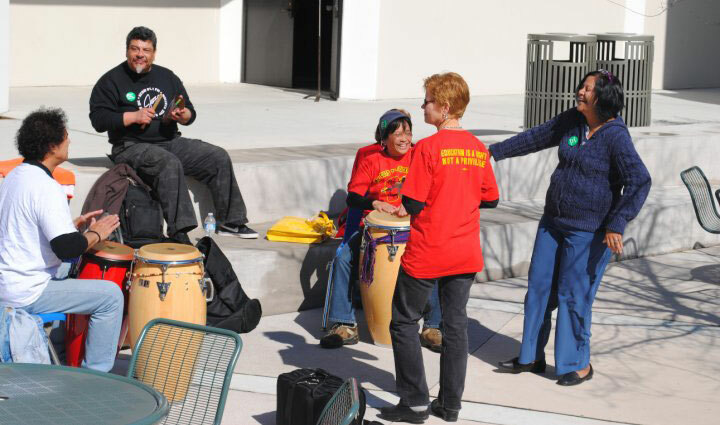 In the Fine Arts Courtyard, Lisa Melnick (ESL and PE), Rudy Ramirez (Ethnic Studies), and Freddie Navas (student) invited all to attend through their resonant creative drumming. CSM Associated Students, aided by Aaron Schaefer (Student Activities), provided attendees with materials for writing to legislators and information about the March 22 demonstration in Sacramento, including forms for signing up for rides to Sacramento on buses provided by ASCSM. 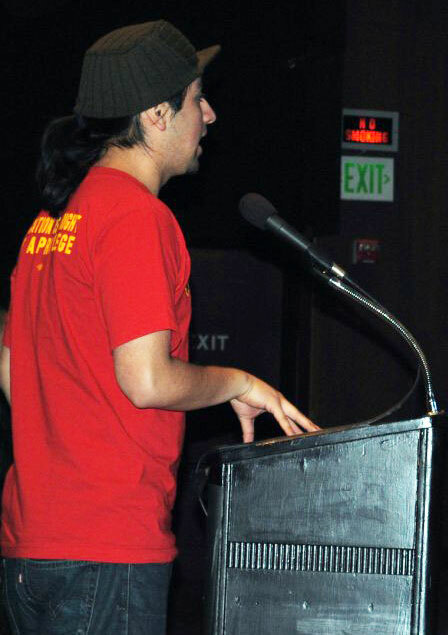 The ad hoc staff/student Teach-In Committee, which coordinated and facilitated the events under the guidance of Kate Motoyama (Speech), sold out its stock of red “No Cuts to Education” t-shirts at cost and provided computer stations maintained by Angela Skinner-Orr (Geography) so students could email legislators and the governor on the spot. A large white bedsheet on which faculty had posted comments, drawings, and photographs was displayed in the floor to ceiling windows. Attendees came and went according to the demands of their schedules; Teach-In Committee members Dave Danielson (Philosophy), Dan Kaplan (AFT), Kate Motoyama, and I (English and French, retired) facilitated events. ASCSM presented a video of Nigerian novelist Chimamanda Adichie discussing “The Danger of a Single Story”—that is, having only one interpretation of life—, and Alex Quintana (ASCSM V-P) followed with a talk on the need for students to tell their own stories. Angela Orr used a video based on Naomi Klein’s The Shock Doctrine as lead-in to her own vigorous analysis of the threats to education in California, “Shock and Awe: Privatizing Education.” Half a dozen ASCSM students—Brittany Murphy, Stephanie Chiu, Francisco Estrada, Tryn Miller, and Shaniel Maharaj, and facilitator Alex Quintana—then spoke passionately about their educational experiences and what those in the audience could do to become politically involved. 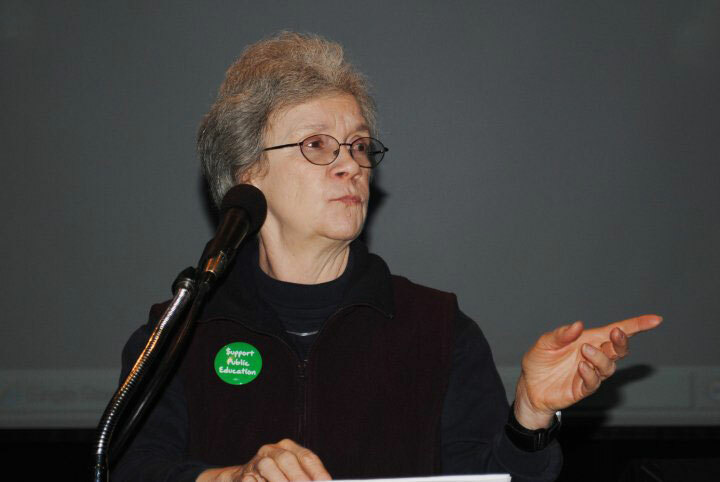 Sanda Everette (student), whose yoga and Italian classes are threatened, provided voter registration cards and urged students to register and vote. Brayan Pelayo (student) got Eddie Britten and other student athletes in the audience to come forward and tell how the budget cuts would affect them. One of them, CSM basketball player Raphi Buenafe, introduced her teammate Janisa Jones, who had put in an extraordinary performance on the court the night her home in East Palo Alto was destroyed when a small plane crashed into it on February 17. This was not the only story in this moving session about using athletics to overcome hardship. 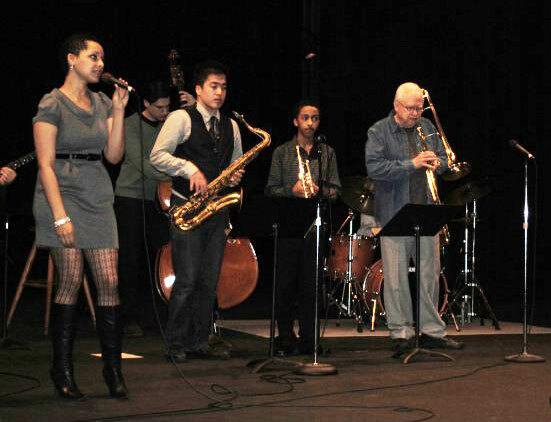 The student Jazz Combo performed under the guidance of Mike Galisatus (Music): Bilal Hasan, drums; Paul Federighi, bass; Alan Lee, piano; Rich Young, guitar; Danny Bereket, trumpet; Niko Larot, saxophone; Frank Phipps, trombone; and Jeanine Robertson, vocals. Their elegant performance of “Misty” and other numbers made me forget it was morning and I was on campus, not in a nightclub in the wee hours. Next, student composers, musicians, and singers Mike Pre and Oshyn performed their rap/hip hop “If We Could Change,” which they had written in response to the crisis. They would perform it again on stage that evening before the thousands at the San Francisco Civic Center. David Laderman (Film) used a clip from Inglourious Basterds to anchor “The Big Picture,” his exhortation to stand up and be counted, and Teresa Morris (Library) explained the dismal state of the library’s budget now and next year, using a video she had made in which the pitifully small numbers were projected for everyone to see. Nick Dellaporta (Library) added his plea for action to her account. Alfred Banks, Michael Cardona, Allison Friedlander, Charles Porter, and Melissa Vizcarra, all students receiving various support services (access, learning disabilities, financial aid, counseling), responded clearly and movingly to questions by Danita Scott-Taylor (EOPS) about how cuts to these programs would impair their ability to remain in college. Then the threat to international students was discussed by a panel of students from around the world: Emanuela Quaglia, Zhan Lusha, and Jade Zoghbi. Students of Sarah Bolton (Dance)— Gloria Boehm-Yu, Elena Elshina, Ashley-Nichole A. Farabee, Diana I. Garcia, Vinette D. Gutierrez, Christina R. Hanlon, Ka Man Lei, Roxana M. Marrufo, Kassandra E. Moniz, Yoko E. Nagayama, Krystal J. Nelson, Amalia L. Personius, Nicole M .Quarry, Rhena A. Renner, Ann N. Scheley, Celease Joy C. (CJ) Sese, Angelica A. Sham, Angelica Suarez, Brittney E. Wagner, and Vivian S., Wang—did improvisational exercises on stage and performed choreography they had learned in her modern dance class. They were accompanied on drums by Lisa, Rudy, and Freddie, still going strong after over five hours of drumming. Sarah also showed footage of her dancers being interviewed by Emanuela Quaglia (multimedia student); the interviews were recorded at last fall’s dance concert, and the DVD including them is available for purchase through Sarah. The on-campus events concluded with a rousing performance of “Blowin’ in the Wind” and “We Shall Overcome” by Helen Souranoff (CSM Theatre manager), accompanied by Rudy Ramirez on guitar. More information about the events and links to photos, taken primarily by students Hansel Vargas and Adam Paramore, as well as videos, can be found on the Teach-In Committee’s Facebook page at http://www.facebook.com/csmbudgetteachins. Whether one attended a single session or was there all day, the presenters and performers made the events inspirational as well as informative. Students, faculty, and other staff united to remind everyone that support services, athletics, and performance classes are and should be part of the total college experience, and that activism is necessary to keep them operating.